In 2015, Mamie needed an immigration attorney. A relative, who knew Dearra Godinez, brought her to Dearra’s office. Mamie was born in Liberia. When civil war broke out, she made her way with her family to Guiglo, Ivory Coast, and lived there as a refugee. She gave birth to a beautiful boy, Wilfred, in 1999. Civil war broke out in the Ivory Coast in 2002, and conditions were not good within the refugee camp. Mamie took Wilfred to his paternal grandmother, who offered to take him in and keep him safe. Unfortunately, the grandmother’s home was attacked, and Wilfred was separated from his family. Mamie later learned that Wilfred was killed during the attack, along with his father and grandmother. A year later, Mamie was resettled in the United States as a refugee. More than a decade later, in 2015, Mamie’s brother, who resides in West Africa, called her. He asked if she remembered their friend from the refugee camp, Alfred. Alfred had called Mamie’s brother and told him that Wilfred was alive. Mamie’s brother was skeptical and unwilling to tell his sister and put her through the heartache if this was not in fact Wilfred. He went to see the young man for himself. Alfred and Mamie’s brother knew it was Wilfred the moment they saw and spoke with him, so they called Mamie. She immediately came to Dearra Godinez. 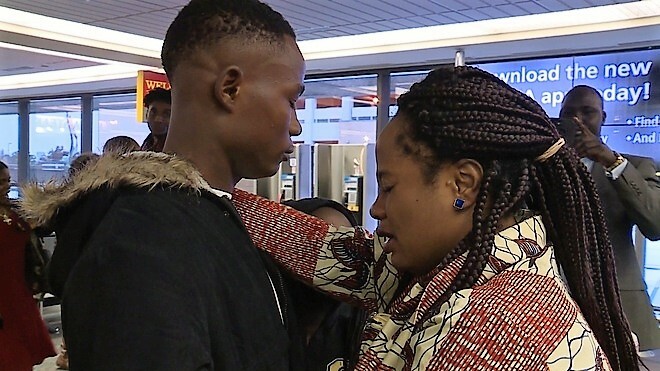 She told Dearra that she had found her son and needed help getting him to the United States. Mamie and Dearra started by filing an I-130 Petition in November of 2015. Of course, a DNA parentage test, among other things, were required to proceed and establish that Wilfred was, in fact, Mamie’s son. Dearra helped the mother and son complete the DNA test and their paperwork. The results of the testing revealed Shelia was in fact the biological mother of Samuel. More than two years after applying, Wilfred received his visa and booked his flight. Wilfred, now 18 years old, arrived in Omaha on Christmas Day, 2017. He and his mom saw each other for the first time since the teenager was 3 years old. Wilfred and her family wanted to express their gratitude to the entire ILC staff for bringing her a Christmas Miracle. She invited ILC’s team to the airport to witness what ILC does for families. Her joy was so great she allowed a local television station to film the reunion. Wilfred’s extended family welcomed him to Omaha with open arms, and Dearra helped to capture the moment for the family in pictures. Overjoyed, Mamie told Dearra that the ILC family is her family now.